Apo-Nadolol (Nadolol) is prescribed as a treatment for high blood pressure (hypertension) or chest pain (angina). The active ingredient in these tablets belongs to a class of medications called beta blockers, which works by inhibiting the action of adrenaline on the blood vessels and heart, thereby reducing the heart rate and blood pressure. 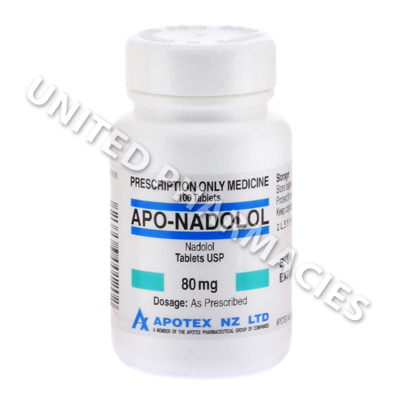 Apo-Nadolol (Nadolol) tablets should be swallowed whole with a glass of water. This medication is usually taken without food. Patients must consult their doctor before taking this medication, so that the correct dosage can be prescribed. In some cases, patients taking this medication have been told to take it once per day. It is also possible that your doctor may prescribe a low dosage for you to begin with, which may then be gradually increased if necessary. This drug will only control hypertension and chest pain, and will not cure these conditions. If any side effects occur, you should inform your doctor. Patients should also note that this drug may cause more severe side effects. Seek immediate medical attention if you experience weight gain, breathlessness, inflammation of the limbs or any other side effects which are not listed here. Patients should note that it is recommended not to abruptly stop taking this drug without consulting a doctor, as this could cause chest pain or other conditions to worsen. Your doctor will need to gradually reduce your dosage when stopping treatment. Patients who suffer from allergic reactions, breathing problems, Raynaud's syndrome, heard or kidney problems, mental disorders, muscle problems, psoriasis, tumours or hyperthyroidism should inform their doctor before they begin taking this medication. Always use Apo-Nadolol (Nadolol) as you have been prescribed by your doctor. Never self-medicate or change your dosage without first consulting your doctor. The correct dosage can vary depending on your health, medical history, and the severity of the condition being treated.